As contractors have begun digging deep underneath South Claiborne, Jefferson, Napoleon and now Louisiana avenues to install new drainage ditches, Uptown New Orleans residents have asked pointed questions prior to each project about what the neutral ground will look like when the projects are finally done over the next three years. On Tuesday night, those residents got their first look at possible answers, including a continuation of the walking path down Napoleon Avenue, public art installations on South Claiborne, tall palms restored to Jefferson Avenue and a variety of landscaping options on Louisiana. For many, however, those answers led to more questions — such as whether the projects will incorporate ideas from the city’s new water-management strategy, which plants could be harmful to traffic visibility in certain locations, and how the canopies over the avenues will look with the finished projects. The drainage canal construction has been starting on each corridor since 2010, with the final Louisiana Avenue leg starting this month. The projects have staggered finish dates as well — the upper portions of Napoleon and South Claiborne will finish in 2015, followed by the lower portions of Jefferson, Napoleon and South Claiborne in 2016, then the upper part of Jefferson in 2017 and finally Louisiana in 2018. The U.S. Army Corps of Engineers and the Sewerage & Water Board of New Orleans have held public meetings prior to the start of each portion, and they promised at each meeting that neighbors would have input into how the roads would look after the completion of the projects. On Tuesday, they presented their initial findings — a broad overview of the factors affecting each corridor, and three possible ways of restoring each. For each corridor, residents were given a choice between two basic approaches — either a “natural” concept, where a variety of trees and greenery were scattered throughout the neutral ground, or a more manicured, formal approach, with trees placed at regular intervals. Those two concepts were then modified with the specific conditions affecting each corridor. For example, one of the options for South Claiborne includes a handful of spaces for public art installations — specifically, at the entrance to Orleans Parish near Monticello Street and near Palmer Park at Carrollton Avenue. The idea, said Keith Villere of the URS landscape architecture firm that created the study, was to create the opportunity for monuments marking landmark locations along one of the city’s busiest thoroughfares. Likewise, many residents have long hoped to see the walking path on Napoleon in Broadmoor extended down the length of the avenue when the project is complete. 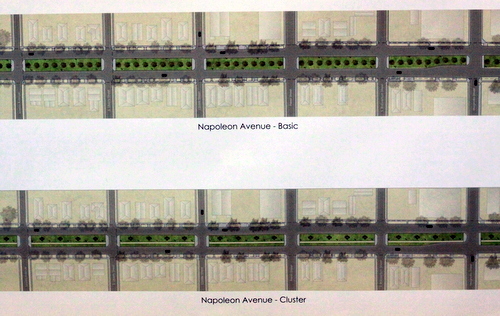 Thus, the options for Napoleon include the “natural” approach, the formal approach (called “basic” in the renderings) or a third option with the walkway surrounded by clusters of small trees, similar to Broadmoor. Ann Farmer, a Napoleon Avenue resident, took issue with the off-center, straight-line design of the walking path, saying she preferred a meandering path like Broadmoor has. She also preferred larger live oaks instead of the small trees in the plan, in hopes of restoring some of the leaf canopy cut down during the project. “The people who have lived through three years on a construction site deserve better than what was taken away,” Farmer said. Villere said that the straight design of the walking path serves two purposes. First, it is a reminder of the historical streetcar tracks that ran down one side of the neutral ground, with trees and lights in the center. Second, the path will likely serve as a watching area for Mardi Gras parades, and in fact may switch from the downtown side of the neutral ground on the river side of St. Charles to the Uptown side of it on the lake side, to match where the parades actually roll. But it is possible, he said, that live oaks could be planted on the opposite side of the neutral ground from the pathway. 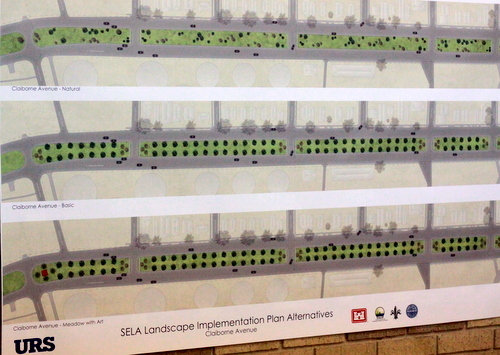 “It’s still under discussion whether the walkway should go on the parade side or the other side,” Villere said. Jefferson and Louisiana are smaller streets, Villere noted, so the options are more limited — live oaks’ and other large trees’ root structures run too deep and would interfere with the new drainage canal just a few feet under the surface. Many Jefferson Avenue residents have asked for the return of the tall palms that formerly were home to monk parakeets, however, so the palms are included in the renderings. 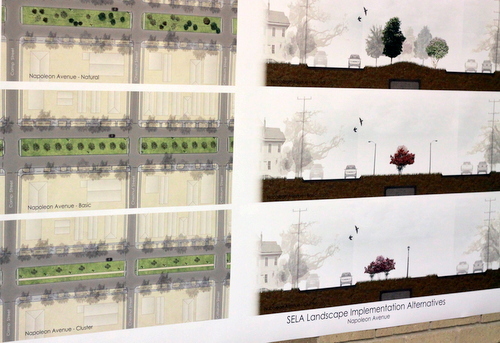 Some residents were concerned about how the new vegetation will affect visibility for drivers, particularly on Jefferson and Louisiana, where the neutral ground provides less room for turning cars to wait. “You want to be able to see a block down, so you don’t get stuck in the middle,” said Jay Seastrunk, a resident of the Audubon area. Based on that feedback, Villere said trees with fewer leaves around the bottom of the trunk may be a better fit for those roads, so drivers can see around them — though the presence of power lines above them will also be a factor. A group of Carrollton neighborhood leaders were concerned that the landscaping plans do not incorporate the sort of water-management features envisioned by the Greater New Orleans Water Collaborative, such as rain gardens or water-retention ponds to increase the amount of rainwater absorbed by the soil and decrease the amount funneled into drainage systems. Those concepts are intended to protect the city’s future by slowing the sinking of the land, and it was disappointing not to see them included. Villere said that they discussed those ideas with city leaders, but they have drawbacks as well. If the wet areas become bogs, they can be hard to maintain, difficult to mow and possible breeding grounds for mosquitos, he said. 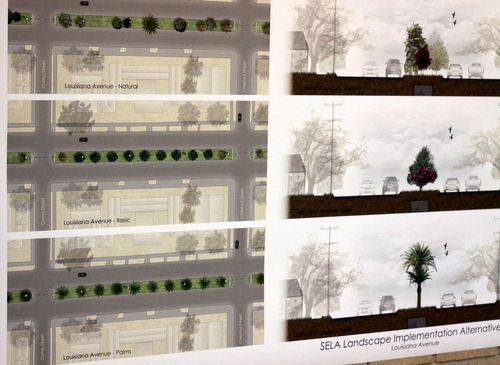 But because the neutral ground will be green spaces, they will help absorb rainwater by their nature. Tuesday’s meeting was just a preliminary step, said Lori Wingate of the U.S. Army Corps of Engineers. Officials will begin poring over the comments they received on each corridor, and try to synthesize the concerns into single proposals for each. In several months, they’ll hold another meeting to show those designs, then take feedback on those before creating a final plan. The landscaping of each corridor, however, is not currently scheduled to begin until construction on all the drainage canals are finished, currently scheduled for 2018. That, too, could change, Wingate noted. For other residents, the prospect of three more years of construction and traffic headaches overshadowed any discussion of landscaping. Rosalind Peychaud of the Milan neighborhood arrived at the meeting frustrated by the announcement that Louisiana Avenue will be closed at South Claiborne until June. where is the alternative for no neutral ground on Jefferson? …or are the residents on Jefferson at war with their neighbors across the street such that a neutral ground is required? There is already a walking path on Napoleon and the other streets. It’s called the sidewalk. No concrete in the neutral ground! If you count the number of people jogging in the St Charles Neutral Ground vs running on the sidewalks along it I’d guess it’s a 10-1 ratio. Especially at night, the neutral ground just feels so much safer. Also, less twisted ankles from the crazy-bumpy sidewalks we have. Although I’ve jogged on the “meandering” path in Broadmoor and it’s quite annoying for this purpose. In the end I’ll just be happy with a well thought out design as opposed to a fill in / plant grass approach I was expecting! another option is for a cinder track. heights blvd in houston has a very nice one. what will these construction projects do to Mardi Gras parade routes this year? No more public art installations unless they’re actually good. 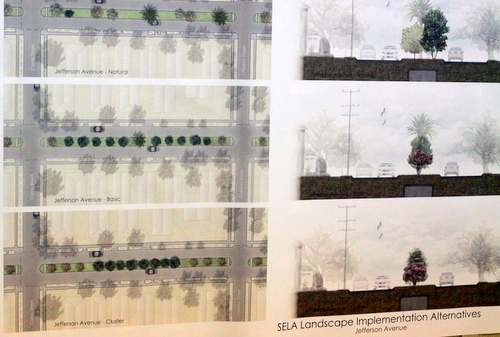 I don’t want the South Claiborne neutral ground to start looking as tacky as the one on Veterans. I agree. The ‘living art’ installation entitled “people, milk crates, and litter on a canvas of sand and dead grass” on the neutral ground across from the convenience store on Gen. Taylor and Claiborne has already created a turnoff to new art installations. Do you have a suggestion as to how to decide what is actually good? Art will always be debatable. I like the stuff on Veterans, but the siting is a problem. Modern sculpture doesn’t work under power lines. The installations on Poydras look great but probably not be as nice on Vets. If you look at the art on Poydras in the CBD you can see a good example of street art. Blends in well, not an eyesore. Wishful thinking but a city monument similar to the fountains at the lakefront and at the river walk would look nice on the Claiborne neutral ground. Put something that will deter Mardi Gras Neutral Ground Parkers. That includes cops and news vans. OK so I can’t believe I’m the only one saying this, but you know what would look best in the neutral grounds of Napoleon/Broad and especially Claiborne? A connecting line from the Riverfront line tracks (they actually end at Napoleon as the building across from Rouse’s used to be that route’s barn before Katrina) at Tchoupitoulas up Napoleon and Broad to the Canal line would make all three lines far more useful and provide direct access to much of Uptown to the courts, jail, governmental offices, and new hospitals. For Claiborne, a higher-speed fewer stop tram line would make the most sense as it could provide a more practical express route. For Claiborne in particular, we don’t need a return to narrow sidewalks, streetside parking, 3 high-speed travel lanes, and no turning lanes. We need to take advantage of this opportunity to undo the damage to our neighbourhoods that anti-urban 1970’s design has caused. We need a shaded, water-centric neutral ground designed to hold a tram from the beginning (and of course, a tram (or streetcar) that runs in its own right of way and not in the street which is absurd) with left-hand turn lanes where practical, only two through-travel vehicular lanes, and finally wide pedestrian areas on each side encompassing bike lanes, landscaping, and sidewalks within a protected elevated section. Judicial candidates question prosecutors’ use of repeat-offender laws Owen Courreges: Can “big-bellied” robots really clean up our city for less money than people can?